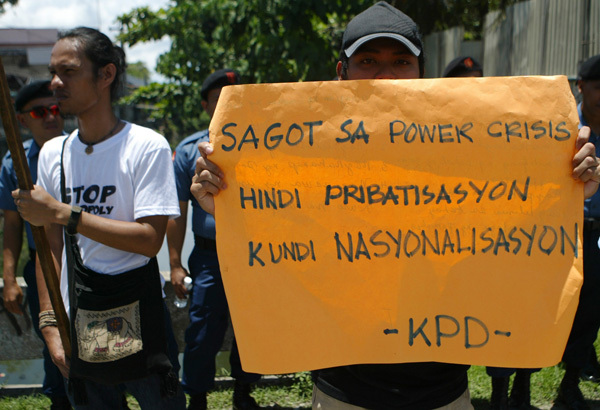 DAVAO CITY (MindaNews/13 April) – Saying the people should “bite the bullet” a little bit more, President Benigno Aquino III today rejected calls to stop the privatization of the power industry as a solution to the power crisis in the island. Speaking at the Mindanao Power Summit at the Waterfront Insular Hotel Davao, Aquino said government was bent on pursuing the privatization intent of the Electric Power Industry Reform Act (Epira) to remove the pestering financial burden plaguing the National Power Corp. But he assured that removing the shackles of the heavily indebted state-run NPC, whose debt stood at P1.24 trillion in 2003 or more than the national budget that year, could free more money to build new power plants or improve further the investment attraction “not only of the energy sector in Mindanao”. Aquino was reacting to a consensus recommendation from the business and political leaders in Mindanao to “eliminate the privatization policy” in the Epira, extend the nationalization policy for the hydroelectric power plants in the region and, in case of hikes in power rates, “make it cheaper over the rate in Luzon and the Visayas”. He said erasing the debt would have multiplier implications, and in the case of Mindanao “businesses will improve our energy sector’s capacities as opposed to the old government-run system, in which these companies’ leaders had no qualms about mortgaging the country’s future to satisfy the people and to please the appointing body”. “From 2001 to 2010, Napocor shelled out $18 billion to service its financial obligations. Yet, from $16.4 billion in 2001, Napocor’s debts remained high at $15.8 billion as of 2010,” Casino said in a statement yesterday. He said power rates have doubled and NPC rates have jumped by at least 95 percent 10 years after Epira was implemented. “You just have to bite the bullet a little more,” Aquino told the summit, saying that efforts, including the scheduled shutdown of one power plant in Bukidnon, would proceed to retrieve more embedded capacities in the existing power plants that were downgraded by years of wear and tear. Of the repair work on its seven power plants in the Agus complex in Lanao and Pulangi complex in Bukidnon, the complete shutdown of the Pulangi plant was the more threatening, with 140 megawatts of running power to be lost within a month beginning April 17. But he said that another 100 mw would be retrieved after the repair on the eroded portion of the water channel in the dam. Aquino said this would leave 70 mw more to even the overall demand of 1,300 mw in Mindanao, whose grid would be primed up more to reach the target of 1,450 mw. He said that this remaining deficit would be sourced from the other generating sources. But he warned that this leveling of the capacity with the demand was precarious “because if any one of the plants malfunction, then the problem returns”. To improve the reliability of the base load, “the simple truth is: you have to pay more,” he said. “Of our P1.8-trillion budget, remember that only P400 billion of this is programmable. So, can government pay for new plants, plus old loans, and still provide the services and facilities you need?” he added. Vicente Lao, president of the Mindanao Business Council, expressed reservation about the denial of the Mindanao position to shield the island’s hydroelectric power plants from being sold at auction. “Will we still have to pay more because we believe that the loans would not still be fully paid after we sell these plants?”. Aquino said that Mindanao has to accept some trade-offs in exchange for reliable supply. “What we need you to realize is that the old days of cheap power are no longer sustainable, and you must also put in your fair share in solving the problem. You have to pay a little more for the current and future health of the energy sector in Mindanao,” he explained. Since January, the NGCP has reduced the power supply sent to the 27 power distributors and electric cooperatives in the island due to shortage in supply allegedly due to reduced generation from the hydroelectric power plants and the partial utilization of the other sources of energy. Areas in the Zamboanga Peninsula, Southwestern and Southeastern Mindanao, including those in Bukidnon serviced by the Bukidnon Second Electric Cooperative, had to sustain brownouts lasting as long as four hours. After the government agreed to remove the mandated contingency reserve and use it in the grid, brownouts had reportedly improved also in these areas by half. Davao City, some areas in Davao del Norte, Cagayan de Oro City and some parts of the Caraga Region, either have rotating brownouts of 30 minutes or none at all.